Can you be brave on your adventure? Braveland, from developer Tortuga Team, was originally released back in 2014 for mobile and a variety of expansions added new heroes, enemies, and locations to the old-school strategy RPG formula. 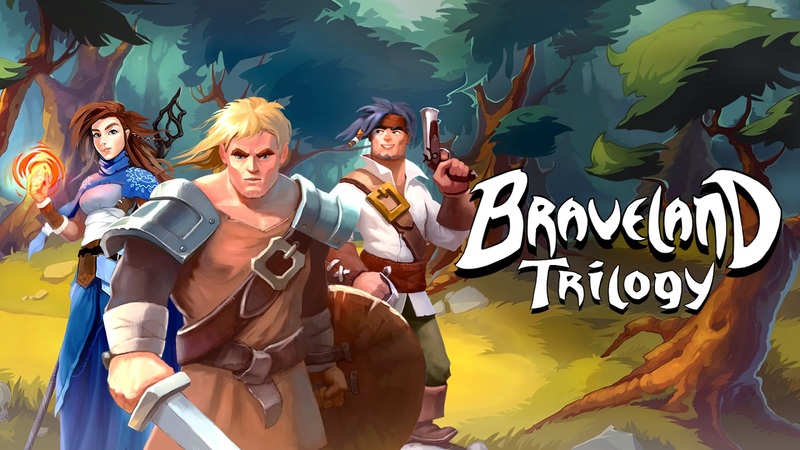 Now, Braveland and its two other expansions: Braveland Wizards and Braveland Pirates, are all in one package on Nintendo Switch as the Braveland Trilogy. For most, this will be a worthy entry point into the genre, but for others, the simplicity in everything may be a turn off to experienced players. First of all, Braveland Trilogy is fairly standard fare for a turn-based strategy title. You will be making your way across a slowly expanding map with various vistas and enemies to kill, all the while hiring new fighters to join your cause and fight more advanced enemies. Your main general can be geared up and levels up as you complete assignments and defeat enemies. The story centers around your general going out into the lands to bring some justice to wandering mercenaries and become embroiled in a greater conflict to save the world. You start off only being able to command one general, but you can unlock two other commanders and hence complete the trilogy of games. Braveland’s mobile tendencies shine through in the presentation and bite-sized, linear nature of the stages and map and while this doesn’t completely detract from the experience, it can be a little too barebones in presentation for the majority of your adventure. Gameplay-wise, the combat is about as deep as you would expect from an overly simplified strategy title and the difficulty isn’t going to challenge you as I was able to make my way relatively unscathed throughout my playthrough if you know the basics of the genre. You basically choose your units, swing or fire your weapon, and continue this until you beat the main boss at the end. Playing through all three chapters was a short and sweet experience and this reminded me of the type of game you want to play alongside watching a show or listening to a podcast. While Braveland Trilogy is a strategy title at heart, there are few actual tactical options. The only other options to combat are either to forgo attacking to defend or utilizing characters’ special ability. However, for the most part, you will just be looking to do as much damage as possible in the quickest way you can. This is one of Braveland‘s biggest problems because, while it does get somewhat more challenging, the strategic element really never comes into play and it’s completely possible just to brute force your way through the entire game by just making your way to the enemy. To progress in your adventure, it involves following a set of linear paths. At times, events branch off but only usually for a few steps in order to gain a new bonus or set of troops. It’s a fairly restrictive process, right down to your inability to replay previously completed battles in order to gain more experience. There’s also no distinctive penalty for death in battle other than a reduction in gold gained, and this further solidifies its easy-to-play nature. This is not to say that Braveland Trilogy is a bad game, nor is it great. It’s exactly what it was intended to be as a simple entry point for players wanting something accessible in the turn-based strategy genre. Nothing really stands out about Braveland or demands that you take notice with its features and style better suited to a mobile audience. The simple, yet fun adventure you can drag out over short-bursts and not become terribly engaged with. Braveland Trilogy is the perfect game for letting new players to the turn-based strategy genre to experience and is also a good way for younger players to learn the genre. Braveland offers nothing new in the surprise and delight category, I really wanted to love it but my deep strategic roots were just too much to overcome for me to really find enjoyment from playing. That’s not to say that someone who wants a more simplistic experience won’t enjoy this as everything runs solidly and the combat, stat building, and gameplay mechanics are solid. I can tell Tortuga Games put their heart into Braveland Trilogy with a cute art style, solid music, and gameplay mechanics that are completely serviceable. It’s worth highlighting developers that put more than just a mobile port on the Switch and Braveland fits that bill. Braveland Trilogy may not be for me, but I can respect what it’s trying to set out to accomplish and I can appreciate it for that.